New improved version now goes down to 100 KHz and up to 61 MHz < 1.5:1 SWR! 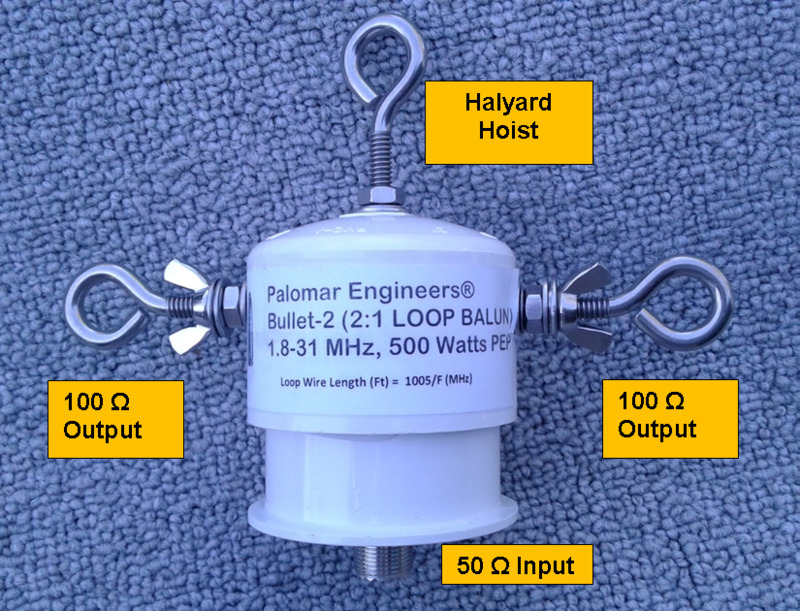 The Bullet-2B is a dual core current balun with a compact enclosure (looks like a bullet) enclosure that is lightweight and easy to transport for your portable loop antenna solution. Halyard hoist at top of balun for convenient attachment point. Input is via SO-239 coax connector and output with side eye bolt output. Rated 500 Watts PEP Watts from .1-61 MHz. This transformer requires a feed line choke to isolate the coax feed line from the antenna. A coax noise filter is also recommended. Loop antennas are some of the best radiating and receiving antennas you can make. They can be in a triangle (called a delta loop), square or rectangle or even a circle. Horizontal loops can be fed anywhere that is convenient. Vertical delta loops(circumference length=1005/f(Mhz) are best fed 1/4 wavelength (length=246/f(Mhz)) from the top point down one side. NOTE: We rate our Bullet baluns (and ununs) VERY conservatively at 500 watts PEP with a 50% duty cycle. 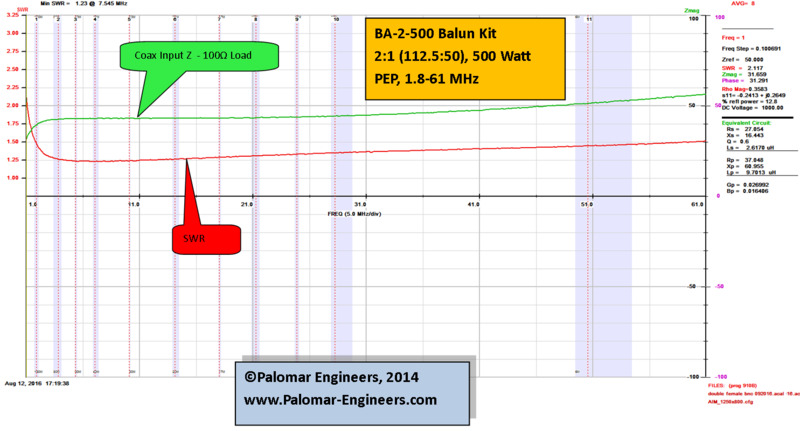 Some manufacturers selling low cost baluns may use a 5% duty cycle for their PEP rating to make it appear you get a higher rated balun for a lower price, but you may in fact be getting be getting less. Their 1500 watts PEP really means 75 watts continuous or 150 watts at a 50% duty cycle compared to our 250 watts at 50% duty cycle. Our baluns typically cover a larger frequency range under 2:1 SWR which make your transceiver happy and probably will last longer with less electrical stress. Remember we over engineer our products, to out perform our competition - just compare the weight of our baluns to theirs and you will know we put much more into our products so you don't have to worry about failure at a critical moment.